I Know You’re In There – Winning our War Against Autism is the true account of a family’s triumph over autism. Ryan’s parents realized there was something not right with their son. They knew it before the psychiatrist predicted Ryan would end up in an institution. The autism diagnosis ripped away every dream these parents had for their child. Ryan was stranded on Autism Island and their family was stuck there with him. There was no recovery from autism. There was no cure. There was no hope. Or was there? Ryan’s story shows what is possible when a child’s medical issues are treated in conjunction with intensive behavioral and educational rehabilitation. Ryan’s mom chronicles the long and difficult road she traveled to help her son become the successful young man he is today. Ryan’s family couldn’t give on him, because sometimes they caught a glimpse of the kid they knew was in there. Ryan now does all the things the experts said could never happen. He works as a systems engineer at a major aerospace company. But more importantly, he is happy. 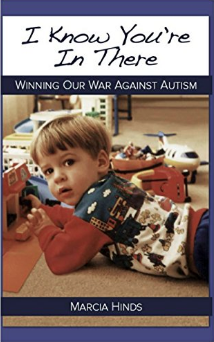 The Center for Disease Control (CDC) now reports, “…1 in every 50 school age children has autism.” The number of children diagnosed continues to grow in epidemic proportions. Many parents are still told there isn’t much they can do to change the future outcome for their children. I Know You’re In There brings hope and inspiration to the thousands of parents looking for answers to this complex medical condition called autism. There is hope… it is possible to have a different outcome for children with autism.